What makes a garden a garden? What makes a garden a work of art? On this tour, you’ll hear from a museum curator, a landscape architect, a mindfulness expert, and gardeners. 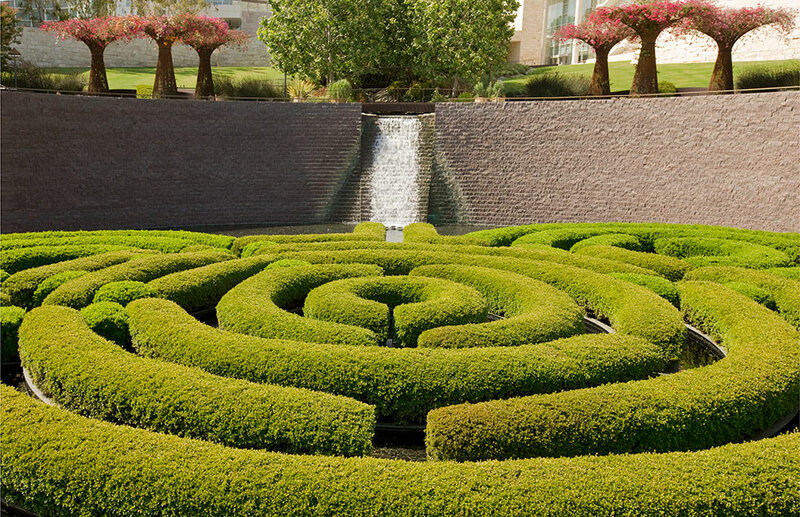 You’ll hear about the garden’s design and about contemporary artist Robert Irwin, who designed it. And you’ll learn how an artist’s vision was transformed into an ever-changing space. Charlotte Frieze: When I first looked down over the garden, I was just intrigued. Huge trees going down the center, and all this color. And at the very end, this view of the Los Angeles skyline. Jim Duggan: When you look at the Central Garden from the top, it’s this big overall experience. When you’re down in the Garden, you come to places where there’s a flower staring you right in the face. It’s a very personal, very intimate, experience. Narrator: Before the Getty Center first opened in the late 1990s, amidst the stark white modernist buildings dedicated to art—a garden sprung. THIS garden is unusual. For one thing, it was designed by someone who was not a gardener. Richard Rand: It was designed by an artist, Robert Irwin, as a work of art you actually move through and experience with all your senses. It consists of forms and textures, light, sound, scents. And in some ways, you, the visitor, complete the work of art by the way you experience it. Narrator: Take this mobile tour and experience the Central Garden in all of its mystery.